At the recent China International Import Expo, held in Shanghai on November 5–10, Produce Report had the opportunity to interview Francisco Contardo Sfeir, General Manager of the Hass Avocado Committee, regarding the Chilean avocado industry and its plans for the Chinese market. Chile produced 224,729 tons of avocados in the 2017–18 season, making it the third largest producer of avocados in the world after Mexico (1.7 million tons) and Peru (270,000 tons). Approximately 30% (66,000 tons) of this was consumed domestically, and the remaining 70% (159,000 tons) was exported. 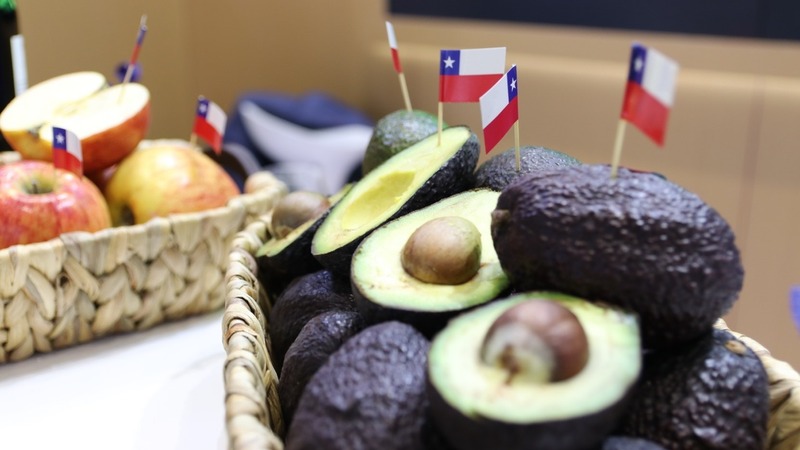 The top three export destinations for Chilean avocados last season were Europe (94,839 tons, 60%), the U.S. (29,661 tons, 19%), and China (14,900 tons, 9.4%), followed closely by Argentina (14,700 tons, 9.2%). In fact, prior to last season Argentina was the #3 export market for Chilean avocados, highlighting the increasing popularity of avocados in China. Indeed, as Mr. Contardo Sfeir explained, worldwide demand for avocados is growing by 12% annually, whereas global production is growing by only 5%, creating a “very good problem” for avocado growers. Hass avocados account for 98% of Chilean avocado production and 95% of global avocado exports; this cultivar dominates the global avocado market and its name is synonymous with the avocado itself. The Hass Avocado Committee aims to support the Chilean avocado industry and promote Chilean avocados around the world, as well as providing technical support to its members and engaging in research to improve produce quality. Chilean avocado growers aim to increase their production by 8.8% this year, to a total of 245,000 tons, by employing more efficient production methods such as decreasing the spacing between trees and increasing the average fruit size. As avocados are sensitive to cold weather, 70% of Chilean production takes place on the sides of hills, allowing the cold air to pass over the trees. This necessitates focusing on smaller trees for easier harvesting and to avoid the fruit coming into contact with the ground, which can damage the skin. Chilean growers are also working on becoming more efficient in terms of water usage, such as via underground watering systems and reusing water lost to the atmosphere through transpiration, and are currently able to water 3 hectares of land with the same volume of water required for 1 hectare several years ago. This not only reduces the energy and pumping costs associated with hillside farming but also increases environmental sustainability. This higher oil content originates from the weather conditions in central Chile during the summer, which vary between 34°C in the daytime and 10–12°C at night. This temperature variation results in a healthier product containing greater amounts of monounsaturated fats and oils, as well as a longer shelf life, which is essential for maintaining produce quality during the 32–35 days needed to ship avocados from Chile to China. In addition to healthy monounsaturated fats, avocados are rich in vitamins C, E, B6, and K, potassium, folic acid, and omega-3, which may be part of their growing popularity with Chinese consumers, who are increasingly seeking out healthier and higher-quality foods. This is the fourth year that Chilean avocados have been available in China and the Hass Avocado Committee is engaged in online and offline campaigns to promote its members’ produce on the Chinese market. Mr. Contardo Sfeir stressed the importance of marketing avocados responsibly and not overreaching: “We don’t want to sell more. That’s going to happen. Our objective is to sell better.” Part of this strategy involves educating all members of the supply chain, from exporters to importers to wholesale markets, as well as consumers, how to best handle and eat avocados to ensure the highest quality. This will help to avoid consumers having a bad first experience with avocados due to lack of awareness, for example, by eating them before they are ripe and while they still have a green skin. Additional promotional activities will be undertaken in supermarkets and restaurants, such as special offers on avocado smoothies and salads to encourage customers to try avocados, and mascots dressed as avocados will appear at wholesale markets, supermarkets, and shopping malls in Beijing, Shanghai, Guangzhou, and Chengdu. Chilean avocados will also be sold on e-commerce platforms including JD.com and Tmall via the committee’s import partners. This campaign is primarily funded by the committee’s 86 members, namely, producers and exporters of various sizes, based on the quantity of avocados that each member grows or exports.